IP 20 protective cover (optional). S2DA series Dual SSRs have two totally independent AC output relays or common controller in a single standard panel mount package making them ideal for a wide variety of applications including Heating, Lighting and Motion Control. Each Dual SSR has two outputs controlled by two independent inputs. This allows engineers using multiple Solid State Relays in a panel to save space in many applications. Fast-on termination suitable for rated load currents to 40 amps/ 530 VAC per channel is standard. Terminations for the input controls are either square pins or fast-on connectors. Utilizing dual SCR's for the AC switch output with internal snubber, Dual SSRs provide greater protection against false triggering. Model choices include zero voltage or random turn-on switching. Dual SSR offer an improved mechanical and thermal design providing higher capacity outputs and significantly increased power density. Available with either zero voltage or random turn on. 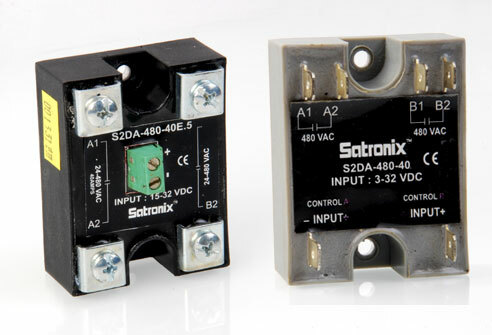 Dual Solid State relays also feature LED input status indicators for each channel. Input Control Voltage Rated operational voltage Rated operational current AC rms. Type S2DA-***- **D S2DA- ***- **E S2DA-***-**W.